All you kiddies out there, we've news! The birthday of one of our dear buddies is coming very soon. And guess what? It'll be celebrated all over the country. Any idea who the birthday boy is? 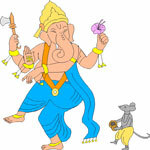 Well, it's our cute and lovable Lord Ganesha, the friend of all. 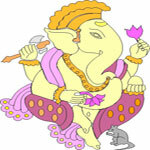 And Ganesh Chaturthi is his birthday. 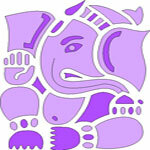 We're sure you're all geared up and can't wait to celebrate Ganesh Chaturthi. To keep you engaged till the festival comes, here we bring to you a grand collection of 4 wonderful pictures to color. 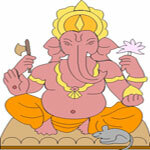 All these pictures are related to Lord Ganesha and Ganesh Chaturthi celebrations. Just click on any of the thumbnails below, and you will get the full image in a new window. Then issue a printout from that page, and start coloring! 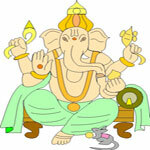 If you want to share the fun with your pals, just click here and refer this page to them. 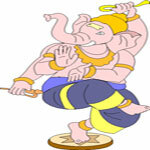 Happy Ganesh Chaturthi!